Our mutual friends, who were dating, introduced me and Mike at a fire safety event in our town and we spent the whole night talking. I work in finance and Mike is a craft beer sales rep. A week later, he took me out for dinner and drinks. From then on, we were together nearly every day. Three and a half years later, on Mike’s birthday weekend, he proposed on the beach in Cape May! Both of us grew up near The Olde Mill Inn and always thought it looked like a beautiful place to get married. It was the only place I wanted to visit. The vibe is so cozy yet elegant. 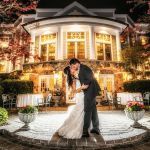 We loved the convenience of our guests being able to stay overnight at the venue, so we made it a wedding weekend and booked our reception, after-party, and day-after brunch all at The Olde Mill Inn. 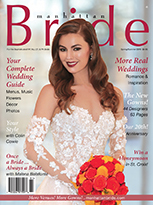 Lindsey Smillie, the sales manager, made wedding planning so easy and fun. John Lietz, the banquet manager, was so accommodating. He helped us choose our menu through several tastings, coordinated with our vendors, and paid special attention to detail. John remembered that my father loves oysters and made sure he had a huge plate of them during the wedding! We had a traditional Catholic ceremony at a nearby church, where Father David gave a warm, thoughtful sermon. Mike’s sister, Ali, sang a few beautiful songs at the beginning and end of the ceremony. Before the cocktail hour, we had a special room at The Olde Mill Inn where guests could enjoy light snacks and drinks. Our cocktail hour was in both the large cocktail room and outside in the courtyard and people are still telling us about how great it was. Our signature cocktail, “The Bruno,” was named after our dog and combined champagne, St. Germain’s liqueur, and club soda. Our butlered hors d’oeuvres included lobster quesadillas with avocado salsa, ribs with pomegranate glaze, parmesan and truffle French fries, and more. We also had several food stations, including an elaborate slider station, a butcher’s block display with peppercorn beef and Vermont turkey, and our favorite, the raw bar served on an ice sculpture, with jumbo shrimp, clams, oysters, and crab claws. The color scheme in our ballroom was gold, burgundy, and crimson red. We had gold chairs at all the tables to match the gold centerpieces filled with orchids, calla lillies, and roses. Our DJ played the perfect mix of modern music and classics, which had guests of all ages dancing. For dinner, we had a choice of salmon in lemon dill sauce; chicken stuffed with prosciutto, spinach, and mozzarella; herb-seared filet of beef; or roasted red pepper stuffed with butternut squash, risotto, and wild mushroom. Thank you to our parents for all their help. We could not have done it without you. Thank you to friends and family for celebrating with us. Thank you to all our vendors, especially our photographer, DJ, and florist, for making everything so beautiful. Thank you to Lindsey and John at the Olde Mill Inn for making all this happen!